The Kodiak evolved from the success of our Teton model. 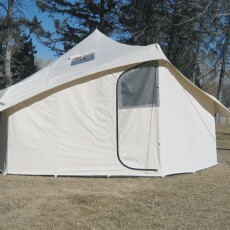 The Kodiak has a 12’x15′ footprint and stands 9’6″ at the center. The wall height is a full 3′. It has been designed to provide maximum headroom with the least bulk in a very popular size. 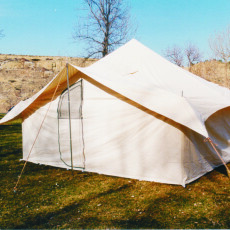 A 12″ sod cloth will allow you to seal up the bottom of the tent since there is no floor. The Kodiak sets up easily with 3 aluminum upright poles and 8 outside wall poles. It is available in the 10.10oz Marine or 10.10oz Marine/Flame treated canvas. I love this tent. The size and price including poles seems like a bargain to me. Setup is pretty fast and easy. Dry and warm in a steady rain. 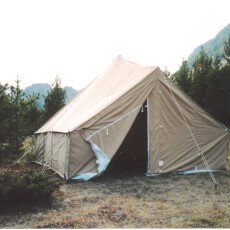 I have owned a Kodiak tent for at least 10 years and have used it frequently many times each year. My guess it have been lived in over 250 days in the time I have owned the tent. Excellent tent it have stood up to intense thunder storms and 50 mph winds. When this one wears out I will purchase another one. My only suggestion is I wish the side walks were four feet tall.